My pilgrimage to the sun begun last week. I am in motherland. I am currently in Pelion, Greece, the land of Argonauts and Centeurs, the land of mountain and crystal blue sea. I thought this would end up a food pilgrimage with many food photos to share but nature has won me over. I bathe in the sea and walk up the steep hills with the excitement of a newcomer, as if I have never encountered such beauty before. As I write this we are getting ready to set off on a coast path hike to the beach of Elitsa (little olive). I have no phone signal here but last night after wild camping in Parisaina cove Dan and I rested in a house (Orlys) overlooking the Aegean. So no phone signal but wi fi yes! Lucky you! Last night in the outdoor kitchen we used giant ripe tomatoes to make a cinnamon and olive pasta sauce. 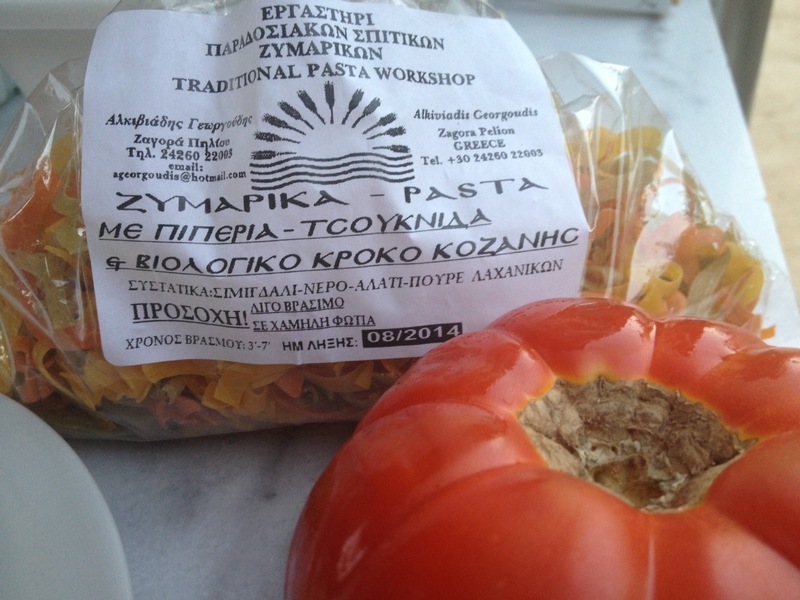 We ate this with χυλοπιτες (hilopites) , short tagliatelle-like greek pasta flavored with saffron and paprika. I got very tipsy on chilled local rose table wine (non pretentious nectar-god I ve missed Greece and how it does not need to feign gourmet grandeur to offer you its delights). 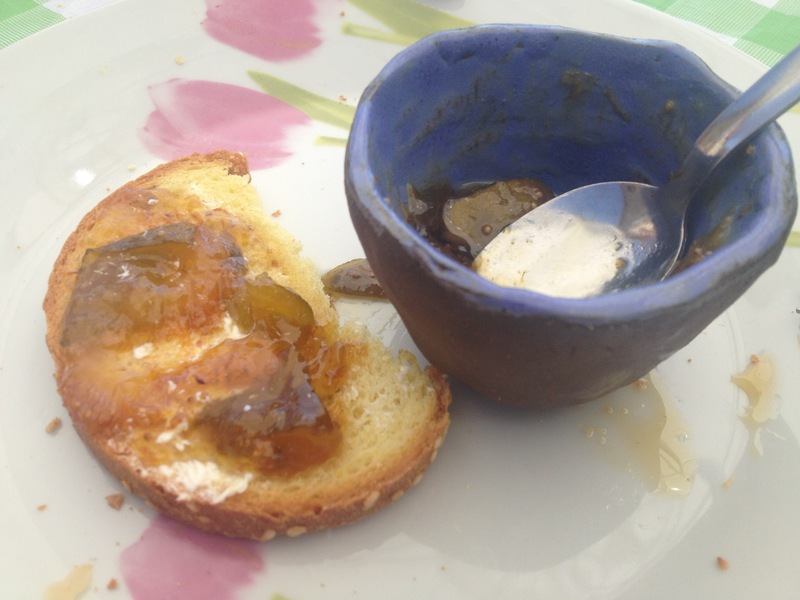 And this morning our landlord , Rony from Tel Aviv, offered us γλυκο σύκο (fig sweet) which we spread on maize flour bread with yoghurt butter for breakfast. 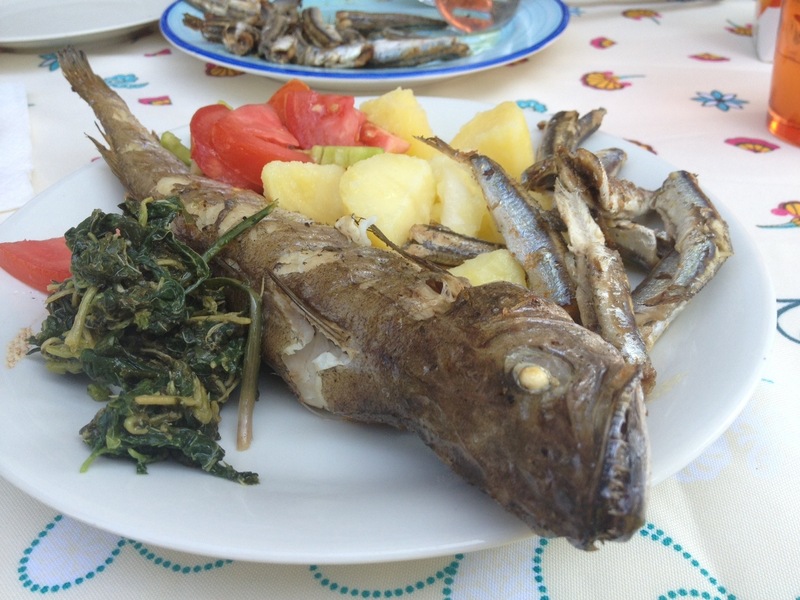 To this day in Pelion these are my humble food highlights together with the salad of κριταμα (kreetama) , coastal greens, and κανάτι (kanati which means jug), slow cooked pork and beef in a light lemon and tomato sauce. But as I am setting off to new coves and hills who knows what awaits me. I am just so happy to be home. 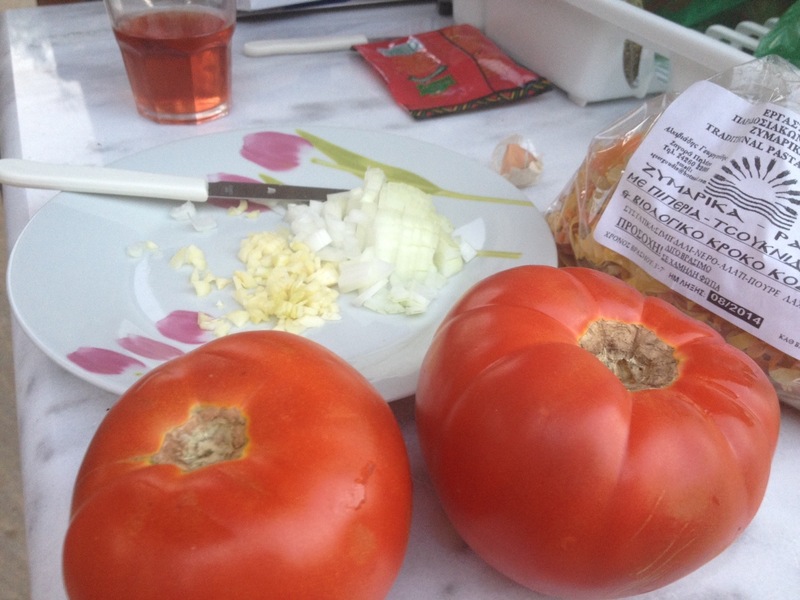 This entry was posted in Comment, Travel and tagged fig sweet, fresh tomatoes, greece, πάρισαινα, χορευτό, γλυκό σύκο, orlys pelio. So jealous!!!! I love Pelio and long for the images you are painting and the flavours you’re describing (ok maybe not the tomato part, you know me hehehe). Enjoy your journey!